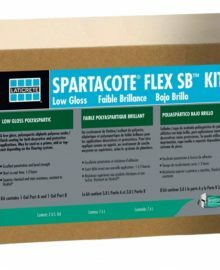 Spartacote is the industry’s leading manufacturer of super high performance polyaspartic coatings. These coatings offer numerous advantages over traditional coatings including super fast dry/cure times, full UV resistance, superb chemical resistance, and ease of installation. Spartacote polyaspartic concrete floor coating materials are manufactured in the USA using formulas that have been patented for their unique performance characteristics. These polyaspartic concrete coatings offer contractors industry leading working time and consistency while providing owners with long-lasting durable finishes, engineered to withstand the harshest of environments. Backed by one of the nation’s most experienced Sales Support Teams, Spartacote can be the answer for virtually any project. Spartacote can be applied as a solid color, or made into a wide variety of colors and patterns by using decorative flecks, quartz, or metallic pigment additives. Spartacote also offers instant crack repair systems, moisture barrier coatings that are tintable, and stains for concrete. See photo below of an entrance area for a Cadillac Dealer. Spartacote was selected for this ‘full fleck broadcast’ install due to it’s super fast drying characteristics, and non-yellowing chemistry since this area will be getting continuous sun exposure. This project was installed in just hours, and the client was back in service the following morning for full use. Laticrete is the industry’s leading manufacturer and supplier of skim coats, self-leveling products, polishable overlays, and underlayments. With over 100,000,000 square feet installed in the USA, Laticrete is the answer for virtually any resurfacing project. Laticrete offers a wide variety of products for virtually any project. Please contact one of our knowledgeable technical staff to assist you with product selection and pricing. Photos below show a severely degraded garage floor that was resurfaced in just hours with Laticrete Drytek Levelex. Once dry overnight, the floor was coated with Spartacote Polyaspartic coating for protecton and beauty.